As I was cleaning the house the other day, I picked up my cross necklace to put it away and my little Sugar dog was very interested. She needed to sniff it. I held it down to her and said, “It’s just a necklace.” yes, I DO talk to our dogs! Then I began to think about what the cross represents to me. It’s symbolism has changed over the years. I think growing up, it was all about “the church” and “the people” of the church. Being expected to do whatever was asked of you. Now I look at this cross. It represents so much more than it used to. It is about my faith. My belief in my God. My independence. My heart being lead to help those in need has nothing to do with “the church”. When I think of the church, I think of religion. This is not a revered word to my lips. In the name of “religion”, countries fight countries; men kill men; brothers fight brothers. Yet it is history. It is our present. One can try to escape it, but there seems to be no denying it exists. 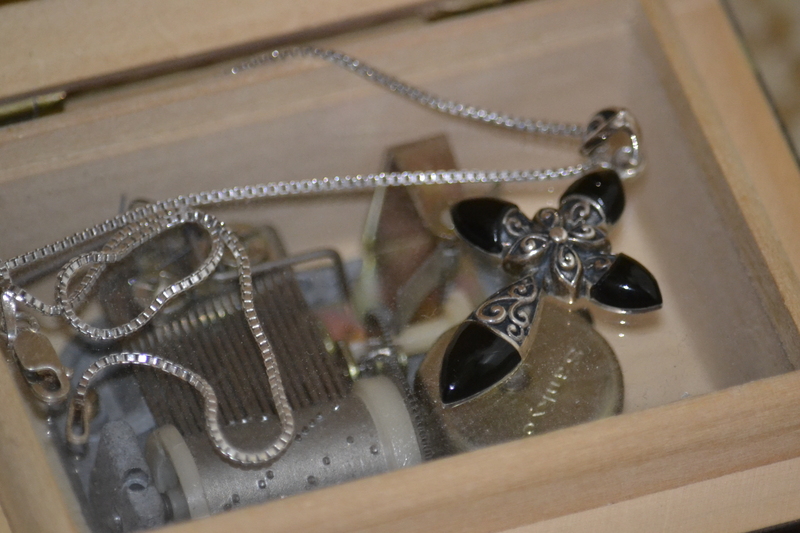 So I study my little black and silver cross and all it represents to me. Prayer. Pain. Sacrifice. Gratefulness. Hope. Peace. This entry was posted in Uncategorized and tagged Christianity, Church, God, gratefulness, hope, necklace, prayer, religion, Religion and Spirituality, sugar dog, the cross. Bookmark the permalink. In a fit of spiritual disillusionment a few years ago, I tossed my cross necklace in the bottom of the jewelry box determined to never let it again see the light of day. Thank you and Sugar for inspiring me to re-evaluate its value to my heart and soul. Along those lines, you might well enjoy the Jim Kraus book The Dog That Talked to God. It’s a light read that will give you cause to reevaluate YOUR faith. On the other hand, I ASSURE you that you WILL spend WAY too much time encouraging YOUR dog to ALSO talk. So far NO LUCK on that front. Thank you for your blog. PLEASE PRAY FOR ROSALIE brought me here. She is our cousin’s Granddaughter. Thank you for mentioning that wonderful family, and remembering them in your prayers. Such FAITH! You put together some deep thoughts on the meaning of the Cross. If we were on the battle field and wounded, we would be more than happy to see the big red cross on the helicopters heading our way. When I see some unsavory looking characters with a cross on a chain around their necks or tattoos of a cross, I wonder what the symbolizes for them. It really shouldn’t be a fashion statement, but I also have some really pretty crosses with jewels in them and when I wear them I’m not thinking about the crucifixion of Christ as much as “does it go with my outfit?”‘ It should be worn with a little prayer of thanksgiving. Something to ponder. There’s nothing like a conversation wiith our pups to remind us of the essential parts of our souls..I really believe that, for their love is quintessentially unconditional..like dare I say the spirituality of love itself..
Oh, you are most welcome!! 🙂 Gotta mix in a little laugh here and there! I love your musings my friend. Amen and amen! http://www.youtube.com/watch?v=1IAhDGYlpqY I think this is a cool video. We watched it in one of my college courses last year. I don’t necessarily agree with it as I am catholic and do like the church but it makes a lot of good points and is really well shot. Let me know what you think.